Christine: As I woke up this morning Archangel Michael started irradiating me in a way that I felt as if I was being pulled up gradually, as usual. I wonder whether other lightworkers are having similar experiences but don’t understand what is causing them because they are not in communication with the Angelic kingdom, the Ascended Masters, or are not receiving tele-thought transmissions from them or the Galactic beings we call ‘our Star family,’ those higher-dimensional beings with whom we share a genetic DNA. We were in a conversation for an hour. 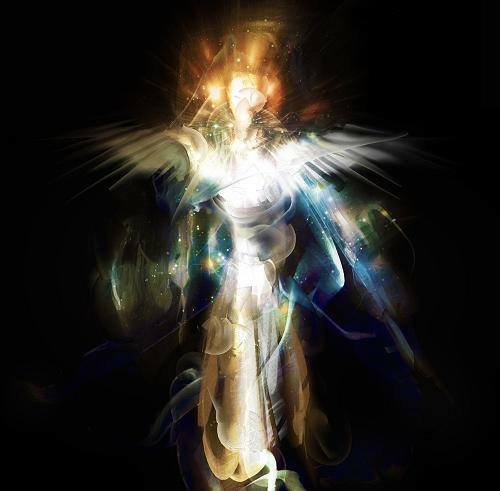 After a while I noticed the electronic presence I was perceiving was of a feminine character and I realized it was the divine complement of Archangel Michael, Archeia Faith, who had taken his place and was activating something in my aura, and was speaking to me. They had switched over in an instant. This is a mystical, supernatural experience, the kind of which the lightworkers and lightbearers are going to experience, if they have not yet, and increasingly so, as we are progressing upon the path of Ascension. After some time in the conversation we were having and which was an instruction, Archeia Faith who had descended as my higher Self, explained that the method used for the transmission of thoughts can be called ‘transcendental communication’ because in order to receive these tele-thought transmissions I am elevated upon the ladder of consciousness and have to maintain a focus with my mind, just as in ‘transcendental meditation.’ I have taken her word for granted as I have never known what it was. I have heard it was taught by a certain Eastern movement back decades ago. It is not the same method as in the case of channelers who leave their body and it is then taken over to some degree or totally. The method used in psychic channeling is apparently not the same as the one that the Spiritual Order of Masters use to transmit messages through their messengers. In that state I could however speak the words, or ideas, that I receive and they would be spoken simultaneously as they are being received. But the focus required is so intense when communication takes place in that elevated state that the action of speaking the words could disturb the fine balance of the focus, and the use of the intellect is also detrimental to it. I sometime fall asleep when it takes place if I am tired when a telepathic communication of this type is taking place. I normally have to use my intellectual mind to some extent in order to make sure I memorise what has been said. But it’s difficult to remember every detail and the way the message was worded. This is why my Ascended Twin Flame André then gives me a dictation that I write down. I think that the transcendental communication is part of something that is being done, like an exercise, to get used to a rising of vibrations in preparation for the final Ascension. They use this time to communicate because it is clearer than during the day time after the intellectual capacities have been usesd. However, I have received dictations from other sources that have taken place as I was writing them down. For instance Mother Mary and Saint Germain, the Master Jesus, Archangel Uriel and Archangel Gabriel, as well as Lord Sanat Kumara. Mother Mary asked me to take a pen and take note when she gave the dictation on the Souls of Maldek. She speaks in what I would describe as a uniformed rhythmic way. I have noticed that characteristic in one of her dictations through the Messenger E. C. Prophet too. I felt their presence outside of me, next to me, particularly in the case of Mother Mary and Saint Germain. He touched my hand and I felt it (please refer to his message entitled Knighthood). Lord Sanat Kumara and my I Am Presence have spoken to me many times from inside the Tube of Light as André, Archangel Michael amd Archeia Faith do when in that transcendental state. They have said to me that they do come as the consciousness that is descending within it. The Tube of Light is a protective substance of Light that cannot be penetrated by anything human or dark effluvia. The transcendental state in question can be brought about by the visualization of the Tube of Light built upon the platform of the Solar Ring and the invocation for the twinned consciousness that is universal and personal, that of Alpha and Omega, of all the Elohim, all Archangels, the Ascended Masters, as well as well as the invocation for the presence, or descent, of the spirit of your own twin flame, your higher self, and divine complement, and the Christ Self whih is the blueprint of the Christ consciousness that you are to integrate and externalize upon the Path of Ascension. I will tell you what I remember first. Then my Ascended twin flame will dictate. Archeia Faith told me something about what is to happen this summer as it has been announced in another message that the interference of the Dark ones is going to be removed. She said that the core of the evil which is a Sinister force and is, or has been, reaching out from the Astral plane, to affect life and the souls of Light, in a direct way, or through their physical agents, is going to be removed at the Solstices this summer. The Astral plane has been raided by the Angelic Forces of the Light for centuries and decades, and has been cleared to a point. There were millions of dark entities. The Lower Astral plane was first cleared by the Angelic forces and finally dismantled recently. But the Astral level has still been used by these fallen ones. The work has been in progress and it has been explained in previous messages that some souls were being disentangled from the grip of either these forces, or the shackles of their own creation. The forces of the Light have had to operate in ways that don’t violate freewill. And they have relied on the Calls and prayers of the lightworkers for decades to accomplish a clearing because of the Law of non interference, and it is the reason that some souls have incarnated to serve in that way, whereas others function as ‘system busters’. In the 1990s the situation deteriorated on Earth in a way that had not been envisioned and what Archeia Faith told me, this morning, is that a deception was introduced about five years ago in channeled teachings because the dark forces thought that by portraying a scenario of victory of the light and liberation, at that stage, they would gain two or three years during which the lightworkers would be off their guard and more prone to distraction so they would not involve themselves so much in spiritual work. It was one of their strategies of darkness and they had many ways of operation for deception. What they knew would take place at a later stage they portrayed falsely and incorporated many erroneous concepts as well. André: There are various forces. For instance, those that work with the Ruby Ray and various forces of the light have pronounced the judgment of the dark forces in past decades, such as for instance Helios’ ratification of the judgment of the dark forces, and just recently, Lord Sanat Kumara has issued his warning to the dark forces that interfer with the sons and daughers of God, and said their interference would result with their being taken and sent to the Courts of Saturn for judgment ‘from this day on’ if they continued with their interferences. These interferences have considerably decreased after this warning, especially in relation to the synthetic dreams they manufactured like movies that they inserted into the minds of people when they were asleep, in order to affect them psychologically, disturb them, worry them, confuse them, or torment them with fears. The Sons and daughters of God are the body of Christ, the true Church in the material world. They are called the Lightbearers because they have the connection to the I Am Presence in the threefold flame in the heart. They are the humanity of this world. The psychopathic parasitic beings of darkness don’t have it. They don’t have the ability for compassion. They have been given a chance and their time is up. The forces of darkness have their counterfeit hierarchy meant to copy the one of the Light and they have impersonated the Masters. They have their pawns and incarnations as well, and they knew they had but a short time as the scriptures said it, or prophesied it. They were allowed to reappear some thousands of years ago and the Atlantean dark magicians who caused the plan of Ascension to be aborted in their days, also reappeared in embodiment, making Edgar Cayce’s prophecy of the second rise of Atlantis to be fulfilled, but perhaps not as some of his followers expected it, because they interpreted it in the sense of the land being raised up again out of the Atlantic ocean. The Atlantean civilization was recreated as well in many ways in modern time. So what is to happen this summer is not so much a new event but the culmination, the peak, of a long period of purification, of clearing up the astral levels. Purification was indeed prophesied by the Hopi Indians. A separation of Reality is going to occur beause the vision and concepts of these dark fallen beings, who are to be removed, clash with that of the humanity that desires peace and to build a refined spiritual civilization on Earth, or Gaia. Mother Mary and Saint Germain have released two messages in which they explain the origin of the sinister force, where the souls of Maldek are concerned. Their incarnation on Earth was the reason that Archangel Michael fashioned his sword of blue flame. It was because he knew that there would be an Armageddon of the Psyche taking place as a result of their coming. It was to give those souls a chance of evolution, and Mystery schools were set up to instruct them and attempt to turn them into beings of Light during the Atlantean age. The souls that did not manage to ascend during the Atlantean age are the lost sheep of the scripture. However, the Atlantean and Maldekian downfalls were also engineered by what the Lords Sanat Kumara and Michael have called the Galactic mafia: it was the Reptilian presence in this Galaxy. Archangel Michael has provided an insight on our galactic history in the long comment that he made in a dictation in relation to a revelation that Sheldan Nidle made in his work ‘First Contact’ published in the year 2000. It was also in relation to the Prophecy millions of years ago with regard to the key role the Earth would play in these so-called ‘End Days,’ ‘Last Days’ or ‘End times.’ These expressions have their origin in a sentence in the book of Enoch ‘the days of the last generation’ and the Essenes of Qumran did believe in that End time. However this was, and is, in relation to the End of Evil, and should not be interpreted in the sense of an end of the world, although it seems that this is just what the dark conspiracies, that create anarchy upon the Earth, as well as corruption, would like to manifest. This force has not abandoned its position of opposition to the Light. It is reacting with rebellion, hate, and vengeance. The ‘end,’ as in the book of Revelation, is in relation to the removal of the Dark forces from planet Earth as their time is up. It’s the Harvest. It also was in the sense of a completion of a cosmic cycle of approximately 26,000 years at the end of which karma should be balanced. It has been announced quite recently that it has been cancelled to the level of 51% and this was the goal thanks to a dispensation obtained by Saint Germain that permits ascension with a transmutation of karma and of the substances magnetized by the soul, amounting to 51%. This cosmic cycle of 26,000 years is on the basis of the duration of the Astrological Ages charted on the Cosmic Clock of the Zodiac. We are now in the Aquarian Age the Hierarch of which is the Master Saint Germain and the Earth is to be freed from those dark powers that have held the strings of their manipulations in order to serve an Agenda opposing the fulfillment of Archangel Michaels’ Prophecy of the Victory of the Light, as it is the Archangels who bring to mankind, or any beings for that matter, the vision of the Divine Will that is to be manifested in the material Universe, in their reality or physicality, and so this Vision was understood millions of years ago as a Prophecy. The dark powers that remained after Lucifer received his final Judgment [please refer to the Video ‘Vials of Karma’] hoped to sabotage the plans of Liberation and Ascension that were to lift up physicality above the reach of these evil ones. You are seeing the Apocalypse taking place in the sense of the true meaning of the word, the etymology of which is ancient Greek, and which means the unveiling of what is hidden as ‘calypso’ means ‘to hide’. This is the Disclosure that you have been waiting for because you realize that truth has been suppressed for thousands of years, and particularly in this day and age with the fall of society into materialism and the manipulation of political concepts, political events, such as those that sought to make you believe in an enemy. Many conditions and enemies were created as a means to create a perpetual state of war and chaos upon the world. The removal of the astral cause of what has led to the present disastrous global situation is going to produce the liberation that mankind desires. Disclosure is taking place now and is increasing especially as the media is now beginning to experience a liberation from the control of the evil Lords. The latter were tricked and lashed out on Donald Trump. He is taking a beating and retaliation from the forces of the Establishment that has never been seen before. They have been the core of many deceptions and conspiracies designed as part of a dark Agenda but the forces of the Light have prevented a good many of them from manifesting. Nuclear missiles and weapons have been deactivated. They have not been able to start a third world war. The suppression of truth has been greater than any one of you can conceive. It was designed by the Anunnaki in the first place in order to keep mankind ignorant of their potential. If this is new to you, please do seek the stories and videos from various sources that can provide an insight about the great historical drama that is about to come to an end now. We are on the verge of a new beginning and of the restoration of a planet. We are about to enter the great age of Transition when, following Disclosure, the work will continue with a teaching and a true spiritual Science as a result of contacts, both esoteric and external with extraterrestrial, Galactic and higher dimensional beings, who have been assisting this Solar System with the work of Ascension. You are entering a period of Transition in which life will be easier and interesting, and in which you will have the opportunity of contributing a service, and in which healing and rejuvenation will be taking place. There will be financial assistance and prosperity. The Transition with new technologies will be in preparation for the Quantum Leap in many years to come to a state of physicality that will be beyond the impact of disease and death. It will truly be a condition of paradise upon a higher dimension, and it will open up new possibilities of involvement in work in collaboration with the Ascended Masters and the Angelic Kingdom in service to the Divine Will. There also is a leap up the ladder of your Density to be looked forward to at the end of this year of 2016, that will permit your visualizations to precipitate faster, so healing and similar changes will also manifest faster. So this is a vision of what is coming. Remain steadfast, dear ones, it’s the finishing line in sight. Thankful for your interest and your work. With Love and Light from Archeia Faith, Archangel Michael and André. Christine: With gratitude for this message as well as to Matt for its publication as video.